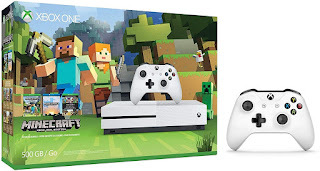 Includes: Xbox One S 500GB Console, full game downloads of Minecraft for Xbox One and Windows 10, 2 Xbox Wireless Controller, HDMI cable (4K Capable), Power cable and 14-day Xbox Live Gold Trial.Brand New sealed in original box. We ship From USA. For Delivery Address Outside USA: Buyer is responsible for import Duty, VAT, TAX and Broker Fee. Watch 4K Blu-ray movies or stream Netflix and Amazon Prime in 4K Ultra HD.